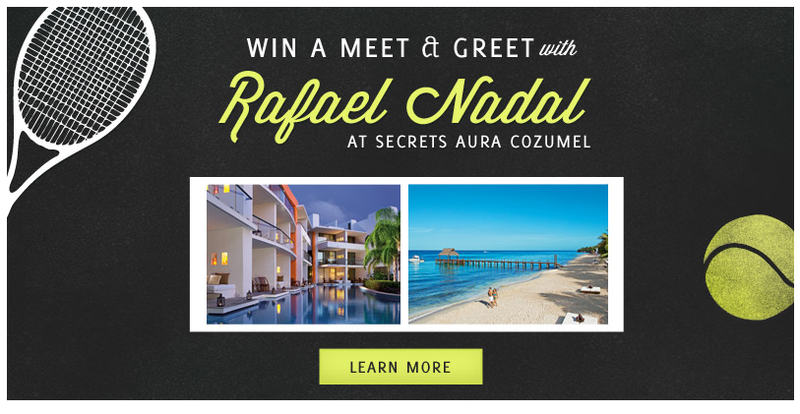 PHILADELPHIA – February 4, 2012 – Secrets Resorts & Spas has teamed up with Rafael Nadal, the 11-time Grand Slam champion, to offer fans a chance to win a three-day, all expenses paid vacation to the Nadal-owned Secrets Aura Cozumel resort in Mexico. The lucky winner will also have a once-in-a-lifetime opportunity to meet the tennis pro and watch him train as he prepares for the upcoming Mexican Open. Participants can enter now through February 10 at SecretsResorts.com by clicking on the special promo page. Tweeting about the contest to the @SecretsResorts handle using the #NadalsSecrets hashtag will get participants an additional contest entry. One lucky winner will be selected at random and announced on the Secrets Aura Cozumel Facebook page by February 11, 2013. The winner will travel to the resort for the meet & greet February 16-19, 2013. Oceanfront Secrets Aura Cozumel Resort & Spa is Secrets Resorts & Spas first property in Cozumel, the popular Mexican destination. Every resort guest enjoys the benefits of the adults-only brand’s signature Unlimited-Luxury® vacation concept which offers limitless access to gourmet a la carte dining and premium beverage brands, 24-hour room and concierge services, endless day and evening activities in spectacular settings; and more. Please visit SecretsResorts.com or call 1-866-GO-SECRETS to book your next vacation at Secrets Aura Cozumel or for more information about Secrets Resorts & Spas’ 12 resorts in seven destinations across Mexico and the Caribbean.